In today's world as the World Economies continue to suffer, more people are looking for ways to make some extra money. Forex Trading is one source they seem to be going to. With the markets being hit with heavy losses you would think that would be the last place to go, but many people are finding that the opposite is true if you know what to look for. Forex Trading is knowing when to buy low and sell at a higher rate and than you can profit the difference. There is many software programs out their that do that, but the natural choice for many is the use of books. They seem to come in all shapes and sizes and let us take a look at how to determine which is best for you. Finding out which book is best for you will take you sitting down and deciding a few things first. There are books on Forex Trading that detail many different aspects of the market so you must know where you want to begin. 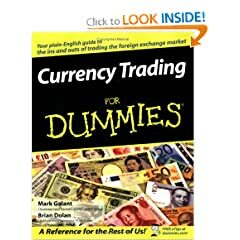 If you have very little knowledge or just starting out than you will want a book that entails everything there is to know about Forex Trading and the perfect place to start is Currency Trading for Dummies. This book will lead you by the hand step by step to show you everything that you will need to know to get the most out of Forex and profit in time. A great book to start with if you have no prior knowledge or experience in this market at all. If you do have some experience though with Forex Trading than the better choice for you will be The Market Guys Five Points Of Trading Success. It goes into great detail about five points that you must understand to get the most from your trading and maximize your profit in the process. Now this book goes through many things so knowing the basics is a must if you are going to use this book. It is a very good book, but not for the beginner. As you can see, many times the book you choose on Forex Trading depends of the knowledge you have of this business. Most people jump into it to quickly and lose a lot of money. This is why Forex Trading books are a very good option and something you should consider before making a single trade. Most people hate to read these days and I can understand that, but many of these books now come with companion CD's for your computer to help you understand it better so you really have no excuse. If you want to really learn the ropes of Forex Trading than get the books, study, and than you will be prepared for whatever the markets throw at you. Without this knowledge, it could cost you a lot of money down the road.